Are you a wedding vendor or other professional who caters to young couples who are planning a wedding? Put your business in front of hundreds of local brides and grooms at our next bridal show in St Petersburg, Florida! Are you a bride, groom, mother-of-the-bride, bridesmaid, or friend of the bride who needs some ideas and inspiration, or a little help pulling it all together in time for the wedding? Come chat with the top wedding professionals in the Tampa Bay area at our next bridal show in St Pete! Our bridal shows in St Petersburg are a fun way for brides and their guests to get ideas and inspiration, figure out their wedding budget, determine their priorites, and get their questions answered about wedding photography and video, catering, wedding planning, flowers, reception venues, transportation, lodging, and much more! 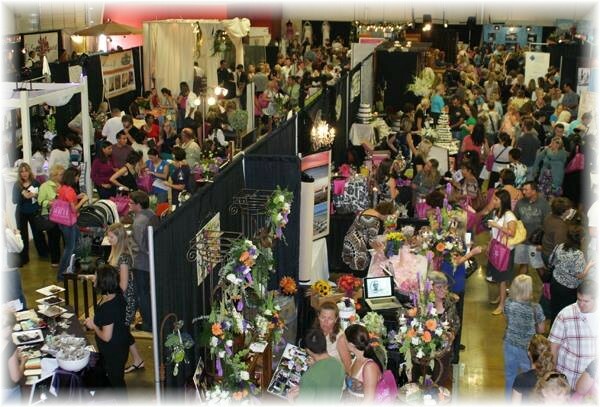 And our bridal shows are an exciting place for wedding professionals to meet and talk to local brides in a "no-pressure" setting to show off their products, services, and expertise! The average wedding in the U.S. costs over $25,000. Obviously not every couple is going to spend that much, but all brides and grooms are committed to investing in what's most important to them when it comes to their wedding. Our St Petersburg bridal shows are the perfect place for brides and grooms to learn about different wedding-related products and services, check prices, hunt for deals and discounts, and figure out their priorities and their wedding budget. If you're a wedding vendor and you're not here when they're making these decisions, you're missing out on valuable prospects for your business, and our brides and grooms are missing out on your creativity and expertise! Check out our wedding vendor FAQs, or jump to our upcoming bridal shows in St Petersburg to check the dates and register for our next bridal show in St Pete! © 2014 smpl.EVENTS Bridal Shows, St Petersburg, FL.